Now before Steve Jobs passing away, Samsung didn't hold high hopes that it can reach any sort of licensing agreements or a deal with Apple over the patent infringement war it hurled upon the Galaxy line. The Korea Times reports that Samsung's legal team has already held "emergency meetings" to reconsider its scorched earth litigation strategy and maybe stop launching counter-lawsuits in all countries where it is being sued by Apple. The executives think that the new CEO Tim Cook, being a brilliant operational guy, and basically inventing Apple's state-of-the-art supply chain system, will be more practical and open to reason. While this all may sound like an episode of "The Godfather", Samsung has every reason to believe that Tim Cook, who is behind the components supply strategy of Apple, and has signed off the multibillion dollar agreement to source parts from Samsung this year, might be more willing to negotiate and put the matter behind for the sake of everybody and the disgust of the lawyers' trophy wives. Samsung filed counter-lawsuits in France and Italy to ban the sales and marketing of the iPhone 4S there immediately after its announcement on Wednesday, but before being aware that Steve Jobs has passed away. Now it is obviously fine-tuning the strategy to put the countermeasures on hold for the time being and reach out to Tim Cook. The next verdict in the global patent war is expected to come from Australia, where the judge has hinted she will have a final decision whether to ban the Samsung Galaxy Tab 10.1 Down Under next week. apple is afraid... the tab is actually better than the ipad. Lol at fandroid logic. Now watch them backpedal. You apple fans continue to amaze me. The ipad is a marvel and so is the tab. But they are for different segments of the population. The ipad is more consumer oriented rather and the galaxy tabs are more tech-geek oriented. The ipad is for people who want to do basic things in a simple way while the tab is for people who want to do something more productive. In the end it all comes down to apple's smooth UI versus android's functional UI. Oh ok so what can you do on an android tab that I can't on my iPad? The most basic thing would be flash content. Then would come too much dependence on itunes. super-bad camera, then would be lack of stereo speakers even though its tablet, having a micro-sd card slot and then would come the fact that it has no standard USB port. Isn't that enough? And the fact that the galaxy tab is almost as smooth means that the only advantage the ipad really has is also not really relevant. Oh ok so I have browsers on my iPad that do flash. So what TASKS can you accomplish that I can't? You know things adults do like check email, browse the web etc. An agreement would be nice. We really need to end this patent battle. APPLE is the one being greedy and afraid of Samsung & wont admit. They banned Samsung almost in every country and Apple dont care bout competition as long their #1. Pisses me off they wont drop the law suit. I believe Apple has the right to call Samsung on any infringements they believe are occurring. But the way this is escalating is poor execution. They need to understand that the parts Samsung provides has helped them achieve the market share they enjoy. Banning Samsung only sets a standard someone can come back and use on them as well as slaps the face of a partner. Protect your product, play hardball, but work it out. This may be both companies last chance to deal with this in a way that allows the mobile industry to thrive as a whole and not have to deal with the ripple effect for years to come. Or they feel sorry for Apple after all that's transpired this week and want to just forget about everything. It could be that as well. Just sayin'. 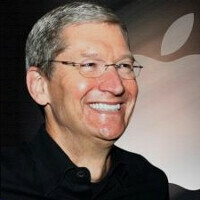 Apple under Mr Crook will be no better than Steve. Samsung says, "look you bunch of certified fudge packing homos...... you owe us big time going back to 2007 for our certified FRAND patents. Now you're still steadfastly refusing to pay up, unlike every other phone maker on the planet. Come Friday in the Dutch Hague, the judge will most likely ban all your iOS products. Either way you will eventually be paying up big time. Make a deal now and we won't turn all your iOS smartphones and tablets into non-3G iPods!" Now Apple's "Copyist" finger has come back around and poked them in their own eye. It's about to poke them in the rear too. Even though they'll probably like that. o_O But they won't like getting their patents all invalidated. Already the Euro iPad "Community Design" got soundly rejected by the High Court in the Hague, along with 9 of 10 of their "Look n Feel" patents. Where several are on their way to being completely invalidated. One in Dusseldorf High Court in December on Appeal (Community Design). Another as Samsung already proved Apple stole their "slide to unlock" patent from Neonode's 2004 release of N1m smartphone along with other Touch Screen gestures. Here's proof:http://www.youtube.com/watch?v=Tj-KS2kfIr0 Apple has been not only pumping fudge, they've been pumping FUD with their RDF generators that are about to run out of steam in their in their corporate bathhouse serving media facilities and get exposed for the liars and closet ***s they are. So it's time to come clean before Samsung turns the steam valves off and expose them for the criminals they are! Steve had admitted how proud he was of Stealing Other People's Ideas, but stealing Samsung's certified FRAND 3G patents was a big mistake. The Samsung Chaebol (like Saudi Royal Family) could crush Apple if they wanted to in spite of them always claiming Market Cap is their value. Wrong.... That would include Total Net Worth of both hard and soft assets and though they talk big, the reality is they are chump change compared to the Global diversity and scope of a Private Conglomerate like Samsung!